Available in Black, Royal Blue/Black, and Red/Black. 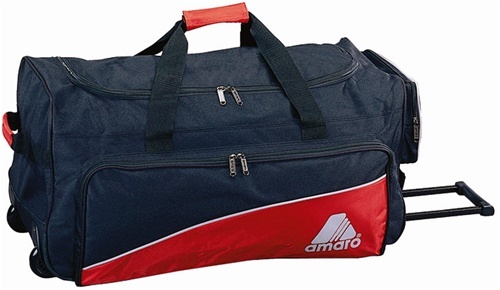 Elegant designed TRANSIT wheel duffel collection is available in two different sizes. (20" and 28") Main compartment has large U-Shape zipper opening. Contrast Nylon color accent and silver piping trim on front pocket. Durable roller blade wheels and trolley systen is securely inside the bottom compartment by a zipper closure. Padded handle on both sides. Additional side pocket for easy access small loose items and travel documents. This item is great to use as corporate gifts by adding the custom logos on either front or side pocket, or top zipper flap.